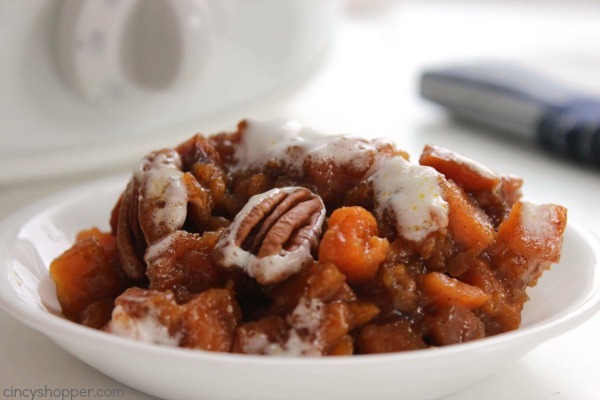 No need to use precious oven space with this Slow Cooker Sweet Potato Casserole. 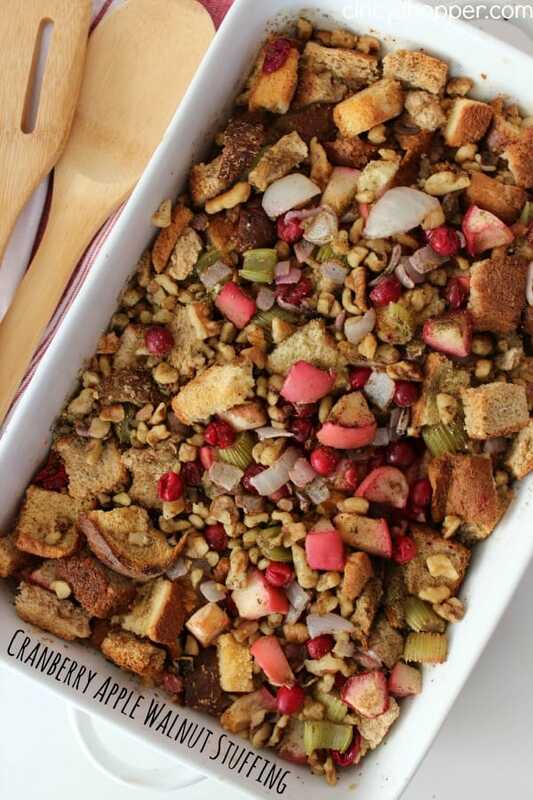 Just grab your Crock-Pot and get this Thanksgiving side dish cooking. 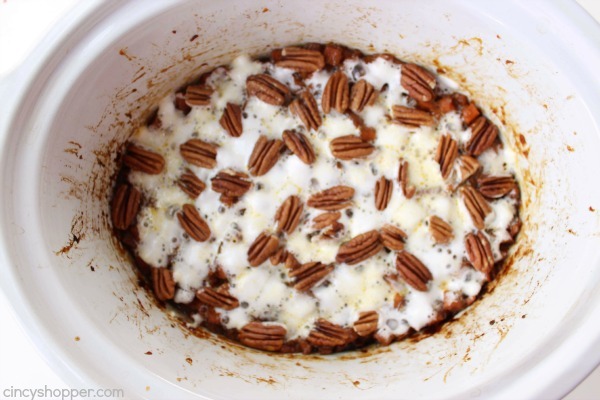 This holiday side dish cooks perfectly and is loaded with lots of butter, brown sugar, marshmallows, and pecans. I own so many Crock-Pots now that I have seriously lost count, ha ha. I have decided this year that anything I can make in the slow cooker will be made in the slow cooker. I normally bake everything and transfer to chafing dishes or our buffet warmer, which is way too much work. I like to share our recipes with all of you here on the blog so testing everything in the slow cooker before holiday dinner day works perfectly. Sweet Potato Casserole is one of the dishes that HAS to be included in our holiday meals. I love the stuff but I would love to have it prepped and cooking while the bird is taking up all the oven space this year. 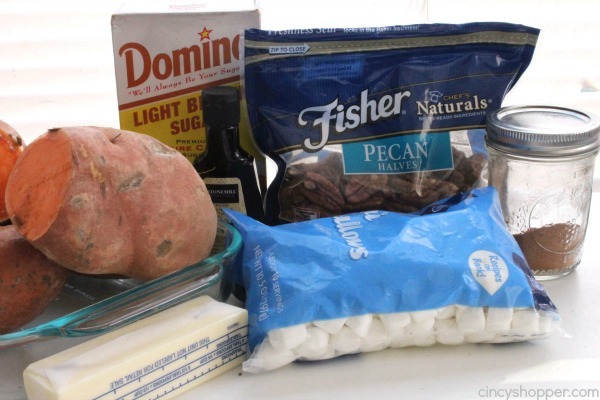 Grab yourself some fresh sweet potatoes, butter, brown sugar, pumpkin pie spice, vanilla, marshmallows, and pecan to get this awesome side dish cooking. Normally, I will leave my sweet potatoes large or even mash them. This year I really liked leaving them diced small. The texture worked perfectly. I know I will dice from this point forward, they were just so perfect. Spray slow cooker with non stick spray. Place potatoes in slow cooker. 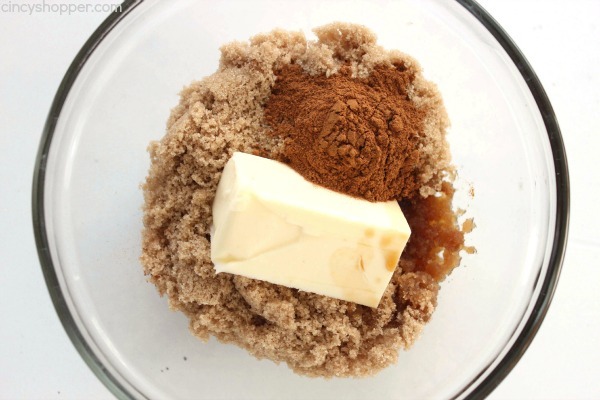 Combine brown sugar, butter, pumpkin pie spice, vanilla and water in microwavable bowl. Microwave for 30 seconds and stir. Repeat until mixture is well blended and warmed. 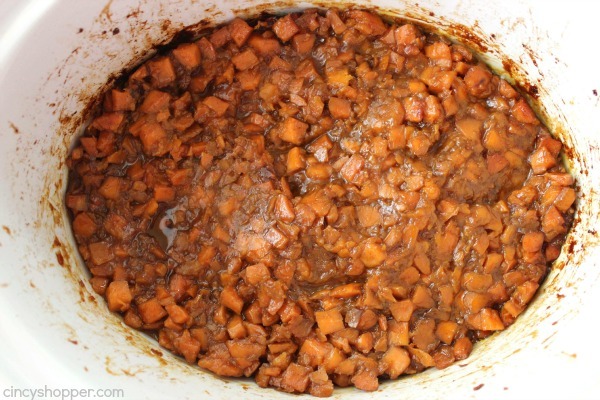 pour mixture over sweet potatoes and mix to distribute. Cover and cook on high for 4 hour or until tender. 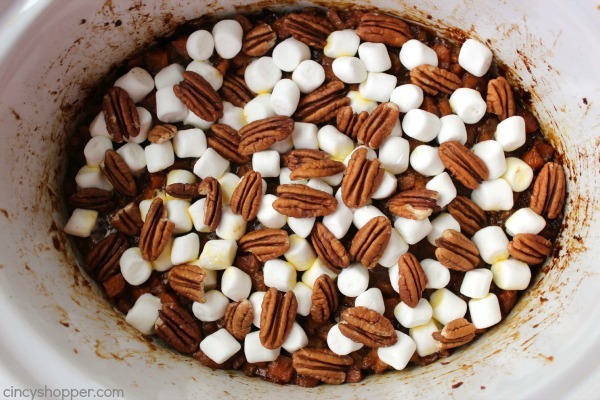 Distribute marshmallows over top and then distribute pecans over marshmallows. Reduce heat to low and recover until melted. For my birthday, I was blessed with a new Kitchen Aid Food Processor. My old one has done it’s job for 15 years and I really liked the new Kitchen Aid processor with the dicing tool. OMG I love it. I dropped my sweet potatoes in and they were diced perfectly in just a matter of minutes. A Food Processor is not needed but I highly suggest dicing your potatoes small because this little secret made our potatoes just right! 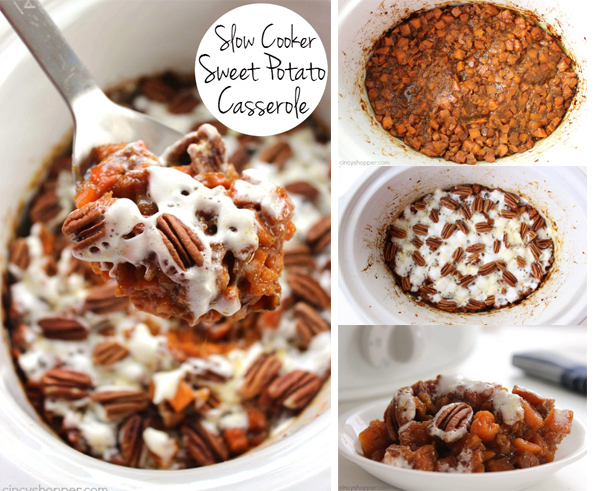 Do you use your slow cooker for your holiday side dishes? I am looking forward to having everything cooking in our Crock-Pots this year, so much easier. 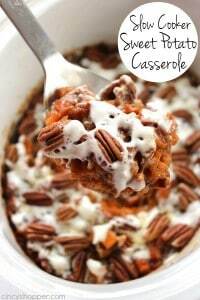 The Sweet Potato Casserole looks so yummy, I had to pin it. Love the pictures and instructions. 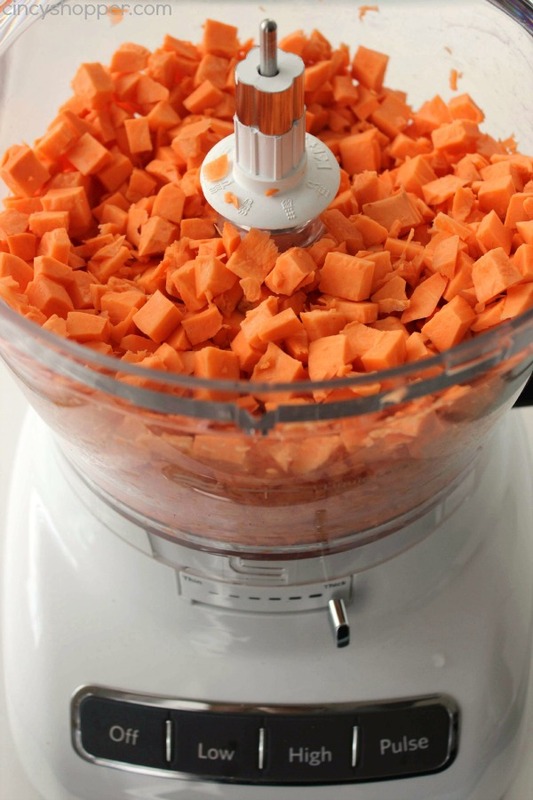 I aslo like your suggestion about dicing the sweet potato in the food processor. I will try to remember that! This looks fantastic! I am all about the easy! 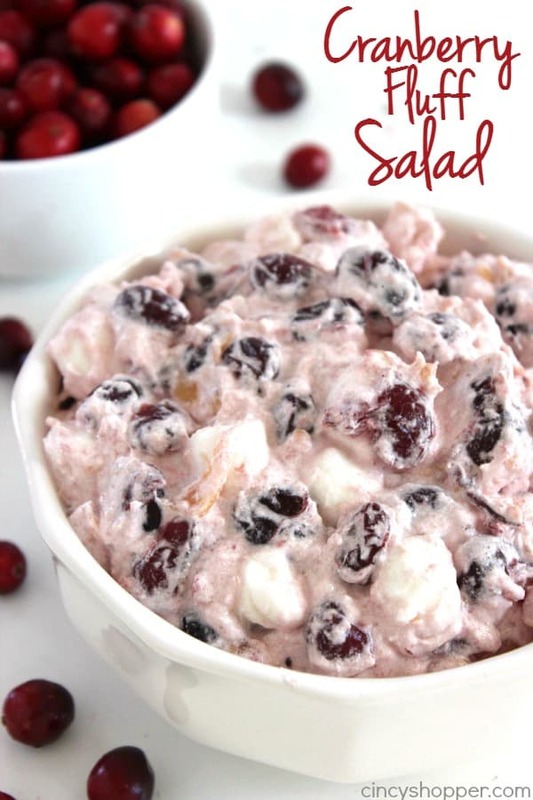 Thanks for sharing this great recipe at Inspire Me Monday link party. 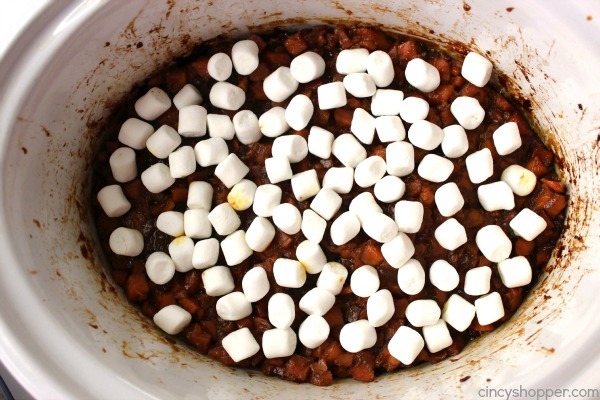 So excited to try this crock pot version of sweet potato casserole. Yum! 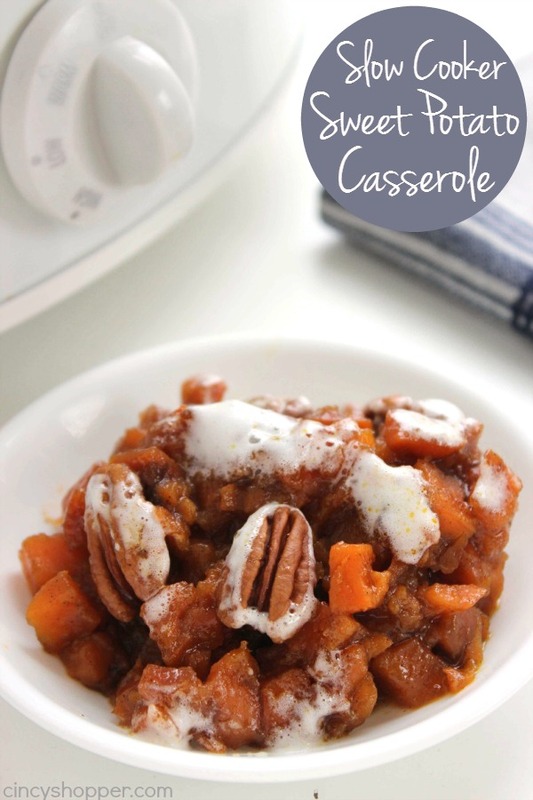 I love sweet potato casserole, but never thought of making it in the crock pot- love this idea! Thanks for sharing! Yum! 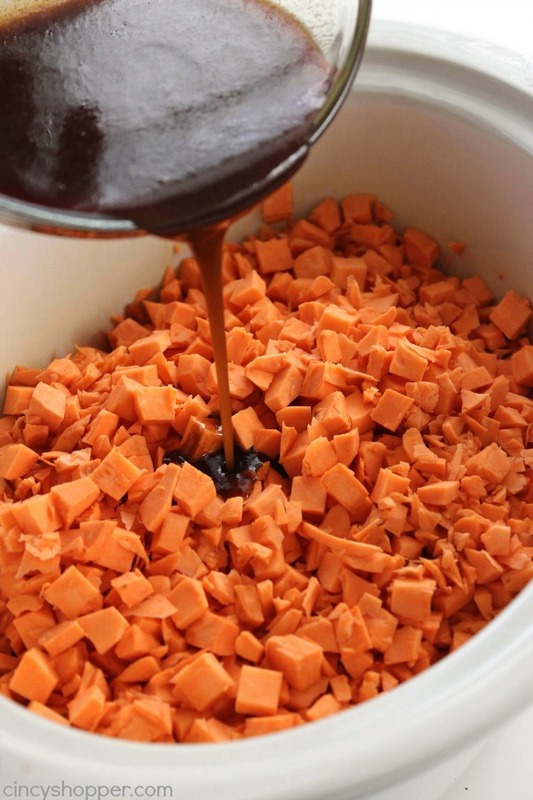 My son loves sweet potatos – he’s going to go crazy over this! Thanks for sharing. I just realized last night how many Thanksgiving dishes can easily be prepared in the slow cooker – freeing up the oven. And here’s another one. Thanks for sharing on the #HomeMattersParty . I hope you will join us again next week. 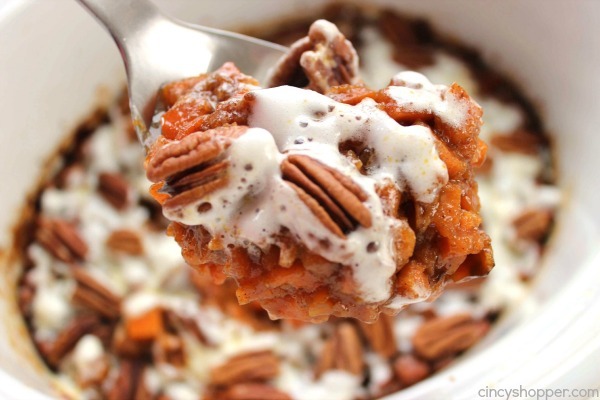 This slow cooker Sweet Potato Casserole recipe looks so good. I really don’t think that I want to dice the sweet potatoes because they are really hard. Can you tell me what brand food processor you use and what the dicing tool looks like? Thanks!! Looks great. How many does recipe serve? Mmmm, this looks delicious! And I completely agree – anything you can fix in a slow-cooker is a big bonus, especially for a holiday meal when your oven space is in high demand. 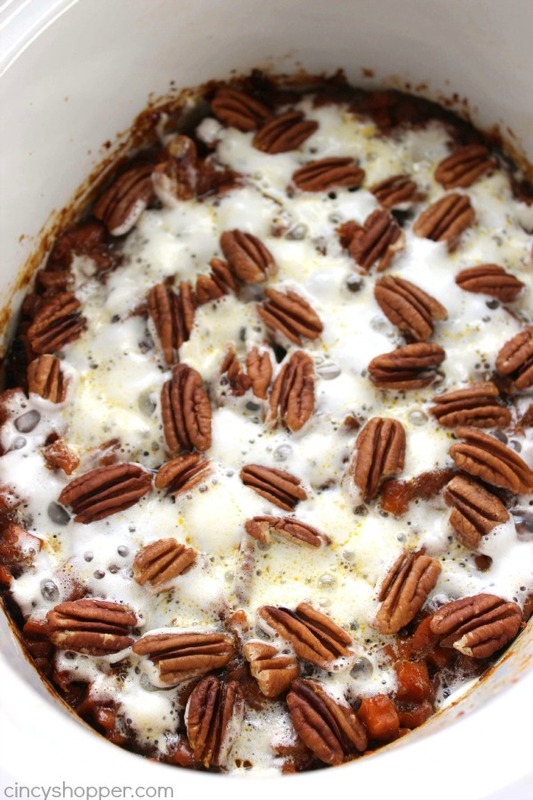 Thanks for sharing your Sweet Potato Casserole at our Merry Monday party. I already pinned it! 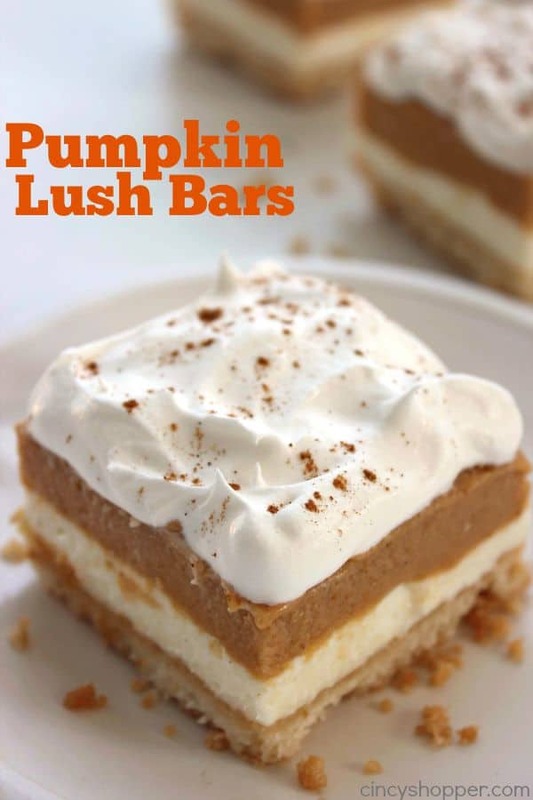 This looks delicious, but 2 cups of brown sugar is a LOT of sugar! That’s not a typo is it?